I am a highly experienced and successful English and Drama tutor based in York, North Yorkshire. I offer individualised tuition specifically catered to the student and their needs and work closely with parents and, where appropriate, schools, to ensure my students meet their goals. Additionally, I am now working with other tutors offering English, Science, French and German, to meet the growing demand for tuition. Tutors are hand selected by me and are all qualified and experienced teachers. I tutor children and young people approaching exams, needing some extra help or wanting to extend their studies beyond what’s offered at school, as well as offering tuition to adults facing new challenges such as mature entry to university and overseas students in need of extra English lessons. Whoever you are, whatever your challenges, PREP can help you be ready for what life is throwing at you with individual, personalised tuition that caters specifically to your needs. I am York’s most experienced English and Drama tutor and am looking forward to helping you meet your goals. Please contact me for further information by emailing elizabethapywell@gmail.com or by calling 07793682303. 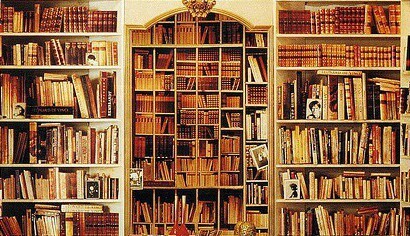 I wish I had this many books. Actually…I probably do!